Father Christmas is coming to Bressingham on selected days in December - see main text. He and his wife and elves, will be at Bressingham on the 30/1, 7/8, 14/15, and 21,22,23,24 December 2019. Entry times vary depending on the day. All days but the 24th have entry from 2pm to 5pm close no earlier than 6pm. 9, 14, 15, 21, 22 have an additional 12pm to 2pm entry slot, 24th has an 11am to 2pm entry slot and we will close earlier. (Extra Sessions are sometimes adde due to demand, the ticketing web page will always hold the must up to date information). There will be food available at Wyevale if you arrive before Santa is ready and at The Steam Museum too during your visit. Booking is advisable and can be made by telephone on 01379 686900 or in person at the ticket office. You can also choose to pay on the day (if tickets are still available), Ticket numbers are limited so it's best to book online. Tickets on the day will be £1 per person more than in advance. #These prices include a Gift Aid donation. All offer types (including Tesco Deals) are excluded from use at this event. 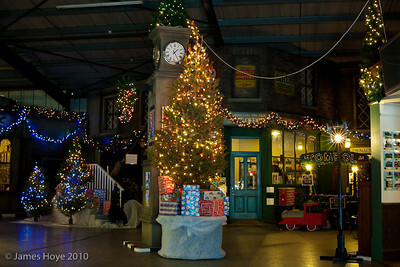 The loco sheds and gardens are closed at this time of year, we are only open for the Santa experience. We are not open before the advertised time on any given day.